During the past years an effort has been made in order to set up a tsunami warning system in the Wider Caribbean region. This effort has been led by Dr. George Maul (see http://my.fit.edu/~gmaul/) who, among other things, is chairman of the IOCARIBE (Intergovernmental Oceanographi Commission) Tsunami Science Steering Committee. For a look at the proposal and his lobbying efforts, please see http://my.fit.edu/~gmaul/tsunami.htm. Can an earthquake and tsunami event like the recent Sumatra event occur in the Atlantic/Caribbean area? The 26th of December, 2004, Sumatra earthquake and accompanying tsunami have generated the justifiable concern of whether something like that can happen in the Caribbean, near Puerto Rico, and/or in the North Atlantic Ocean region as a whole. The available information classifies the earthquake as an approximately 9.0 magnitude event. Earthquakes of this magnitude are associated with seismic fault lengths on the order of 1000 kilometers in length which are associated with subduction zones, and the fact is that the subduction zone along the eastern Caribbean islands cannot accommodate such a fault length. Therefore, we can reliably assume that we in Puerto Rico have a very low probability of directly experiencing an event of such a magnitude, with events in the 7.5 magnitude range being a good candidate for a worst case scenario. In a paper describing a numerical simulation of the tsunami, Mader (“Modeling the 1755 Lisbon tsunami”, Science of Tsunami Hazards, Vol. 9, No. 2, 2001), also states a wave amplitude of 20 meters at Lisbon and along the African and south European coasts, and of 4 meters along the English coast. He also adds that the earthquake was felt over a million square miles and that it appeared to have at least two foci, one of which in North Africa caused ground motion that damaged cities 400 miles south of Lisbon. There is no historical evidence of the Lisbon tsunami affecting Puerto Rico, nor the eastern seaboard of the USA. This is a topic of active research, but one can speculate that the eastern seaboard of the USA was spared because the fault orientation may have been approximately east-west, and it is known that most of the tsunami energy is directed perpendicular to the axis of the fault, this being so the longer the fault. As far the lack of impact on Puerto Rico, it may have been due to refraction effects while the wave passed over the Mid-Atlantic ridge and when it encountered the Puerto Rico Trench, the deepest part in the whole Atlantic basin (depths on the order of 8.5 kilometers). We hope to answer these questions in the near future. Finally, at the March 2004 National Science Foundation Caribbean Tsunami Workshop, held in San Juan, PR, field evidence was presented of a field of huge boulders (some more than 100 tons in weight) scattered inland along the north and northeast facing shores of the southern Caribbean islands of Aruba, Bonaire, and Curacao. Since no hurricane is capable of raising and transporting these boulders, it has been speculated that the culprit must have been a very large pre-historical tsunami. Please see the abstract of the presentation at http://nsfctw.uprm.edu/agenda.html, under Anja Scheffers and Dieter Kelletat, Essen University (Germany) “New Evidence and Datings of Paleo-Tsunami Events in the Caribbean”. See also the following link: http://epubs.lanl.gov/tsunami/ts201.pdf, the article titled “Evidence of tsunamis on Curacao, Bonaire and Aruba, by Anja Scheffers A book with the full presentations of all of the abstracts will be forthcoming sometime in 2005. Henceforth, although the tectonics of the North Atlantic Ocean region are different than that of the Indian Ocean, the historical fact is unquestionable in that 249 years ago the North Atlantic region underwent an event similar to the Sumatra event and paleo-tsunami evidence seems to show the same. And that the Caribbean Sea region is under the threat of history repeating itself, with catastrophic consequences due to the amount of population living in highly vulnerable coastal areas. And we should not forget the fact that we are also under the more probable threat of local tsunamis, like the ones occurring in 1867, 1918, and 1946. As a matter of fact, putting all of these dates together (1755, 1867, 1918, and 1946) nobody can argue that we should not worry about tsunamis in Puerto Rico and the Caribbean. 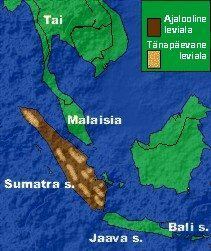 And that, since it is likely that something will be done (after the fact) in the Indian Ocean to start some type of tsunami warning system, a far as historical facts are concerned, the people living in the Atlantic region also deserve the same concern. So the answer to the title of this discussion is YES, it has already happened. 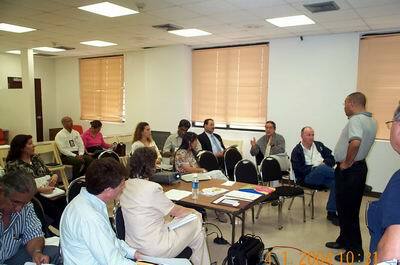 "Killer waves worry Puerto Ricans"
The fourth and last PRTWMP workshop for 2004 was held in Aguadilla, Puerto Rico on November 18, 2004. The municipalities invited included Quebradillas, Isabela, Rincon, Aguadilla (with coastal communities) and Moca (no coastal community but were interested in participating). 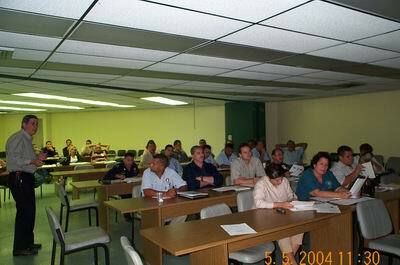 Puerto Rico emergency management personnel from Carolina, Puerto Rico attended the PRTWMP workshop, held on October 22, 2004. The municipalities invited included Loiza, Rio Grande and Carolina (with coastal communities) and Canovanas and Trujillo Alto (no coastal community but were interested in participating). 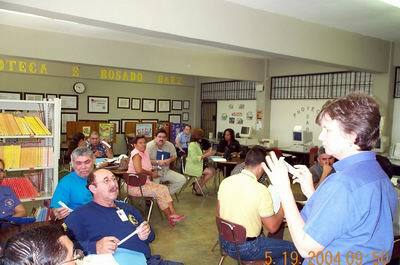 The second PRTWMP workshop was held in Dorado, Puerto Rico. 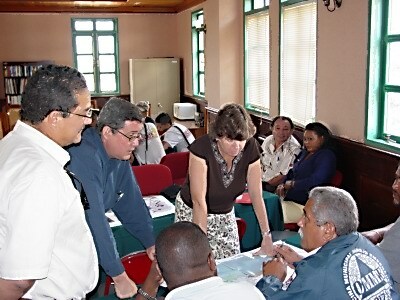 The emergency management personnel actively participated in this workshop. PRTWMPTsunami Evacuation Drill at the Esteban Rosado Baez middle school in Mayaguez. 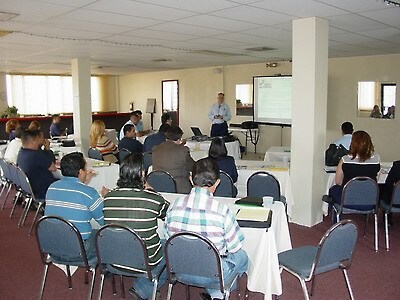 Click here view PRTWMP Workshop: Offered to emergency management agency officials from Mayagüez, Añasco, Lajas and Cabo Rojo. 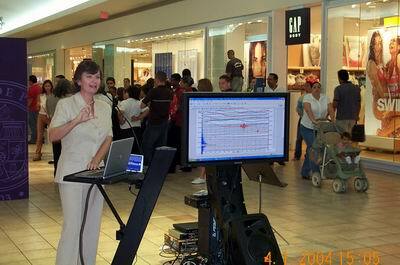 UPR100 Event: Christa von Hillebrandt & Prof. Aurelio Mercado offered earthquake and tsunami presentations and the Plaza Las Americas shopping Mall. Meeting at the Puerto Rico Emergency Management and Disaster Mitigation Agency in San Juan.